Usually, the first question asked about grilling shrimp is whether or not to leave the shell on. The answer is yes. By leaving the shell on, the shrimp won’t dry up. Check the shell if it has a small slit. Usually there is, but some small shrimps don’t have any. This slit is what helps the marinade get onto the shrimp. If you’re going to add plenty of seasonings to the meat, this slit is necessary. Without it the flavors will be uneven. For best results cook on the day you buy it. If you’re thinking of grilling shrimp, you can choose from several types. There are the headless and frozen ones. You can also purchase them fresh complete with heads. The shells come in a variety of colors too. Some are green, pink or brown. Regardless of the type you buy, keep in mind that they thaw very quickly. They come in various sizes. The jumbo size consists of a dozen shrimps for every pound. You can of course buy smaller shrimps. The problem is that these can go all the way through the rack. 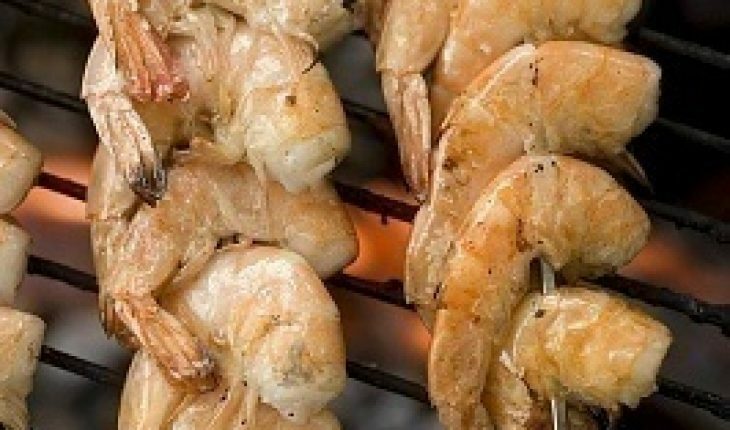 If you‘re new to grilling shrimp, handling small ones with tongs can be difficult. Deveining simply means getting rid of the sand track. This is usually found at the shrimp’s back. This isn’t always needed. If there’s no vein, there’s no sand to clean. If there is, just slice across it with a knife. Take out the vein and wash it with water. Peeling the shrimp is just as easy. Use the knife to cut the shell. Remove everything except the tail shell. Gather all the shrimp. Set them on skewers or at a grilling basket. Set the fire to medium. 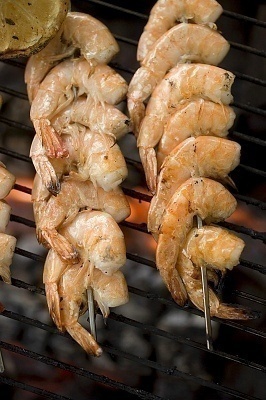 For grilling shrimp, set them on the grill so that they’re about 4 inches from the fire. marinated. You can tell it’s cooked when it turns pink. Turn it around so it’ll cook the other side too. The sign of a cooked shrimp are its pink color and white flesh. If the shrimp is overcooked it will be hard and rough. If the shrimp keeps slipping through, use an oiled grill basket. These are the ones that have latches and hinges. This can also be used when grilling other foods like burgers and hotdogs. If you’re going to use skewers, add just two shrimps for every skewer. This can make it easier to turn each shrimp around. For the jumbo shrimp it’s best to shell them first. Devein if needed but leave the tail on. After cutting with the knife, spread it out. Shrimp can take only 7 minutes to cook. When it’s done, remove it from the grill. If you don’t take it out, it will dry up and turn dark. The process of grilling shrimp is pretty much straightforward. It doesn’t take too long to cook and it’s a dish that you can truly savor with friends and family.